Editor's note: Michael Hartl is the founder of Tau Day and author of The Tau Manifesto. He is also the author of the Ruby on Rails Tutorial, the leading introduction to web development with Ruby on Rails. Previously, he taught theoretical and computational physics at the California Institute of Technology, where he received the Caltech Lifetime Achievement Award for Excellence in Teaching. Earlier this year, the admissions office of the Massachusetts Institute of Technology related an odd tale of a conflict over, of all things, a number. They described "two warring peoples: the people of Pi, and the people of Tau," and proposed a compromise between the supporters of pi (the number 3.14…) and tau (the number 6.28…). As in previous years, MIT would announce its admissions decisions on 3/14, or "Pi Day," but this year they would also acknowledge adherents of tau by sending out their decisions at 6:28, or "Tau Time." It was a noble attempt to broker a peace - and yet, the two tribes fight on. The truth is it's mostly my fault. Here's how it all happened. A few years ago, I noticed that references to a delightful little paper called "Pi Is Wrong!" were popping up regularly on social news sites such as Hacker News and reddit. Unfortunately, even almost a decade after the publication of Palais' paper, the idea that pi is wrong didn't seem to be going anywhere. I perceived the opportunity to remedy the situation with a carefully designed social hack. All that was needed, I thought, was a convenient name and a compelling narrative, together with a new mathematical holiday to serve as a focus for the movement. Inspired by the root of the English word "turn" (τóρνoς), I chose the Greek letter τ (tau) for the number 6.28. The result, called "The Tau Manifesto," launched on Tau Day (6/28), 2010, and immediately struck a chord (sometimes literally). The manifesto and its companion holiday became one of those quirky stories that people of a certain mathematical bent just couldn't help but share with their friends. The resulting "tauist movement" attracted international media attention, influenced MIT's aforementioned admissions announcements, and inspired seventh-grader Ethan Brown to set a world record by memorizing and reciting 2,000 digits of this previously unsung mathematical constant. It even provoked a corresponding (and, in my view, unconvincing) "Pi Manifesto." As with so many ideas whose time has come, this one was not mine alone. In the wake of the manifesto's publication, I learned that physicist Peter Harremöes independently proposed using the letter tau to Bob Palais just around the same time that I notified Bob about the impending publication of "The Tau Manifesto." We then found out that Joseph Lindenberg proposed using τ in an unpublished manuscript way back in 1992! Indeed, Peter Harremöes has discovered that Persian mathematician Jamshid al-Kashi used the number (but not the notation) as early as the 15th century, and thus proposes calling tau "al-Kashi's constant." We've seen now how the battle between pi and tau began. How then might it end? There are many who, although sympathetic to the cause, believe that tau can't possibly succeed in defeating pi. I am cautiously optimistic: my work and the work of other prominent tauists (such as Vi Hart and Kevin Houston, in addition to the others mentioned above) have certainly laid the foundation for eventual victory. In particular, the large number of enthusiastic young tauists (including a high-school robotics team named "The Tau Manifesto") gives me hope. In addition, tau has the truth on its side: a circle is defined by its radius, not by its diameter, so dividing the circumference by twice the radius introduces an ugly factor of two into the equations of science and mathematics. As G. H. Hardy wrote in A Mathematician's Apology, "Beauty is the first test: there is no permanent place in the world for ugly mathematics." Nevertheless, I concede that the doubters may well be right. There is a powerful conspiracy, centuries old, dedicated to propagating pro-pi propaganda. Official textbooks still use pi, and academic mathematicians, though sometimes confessing their support in private, have been apathetic or even hostile in public. But these considerations are ultimately beside the point. The demise of pi would would be but the icing on the cake (so to speak), because "The Tau Manifesto" has already succeeded. Its principal goal was to hack geek culture, and there's no denying that this goal has been achieved. Moreover, even if it had failed to find an audience, "The Tau Manifesto" would still have been worth writing, and not just because I would have learned from my failure. Simply put, it gave me joy to get tau out of my head and into the world. It has been my tremendous good fortune to discover that this joy is shared by so many. So, to all the tauists of the world, I say: Thanks for your support. And Happy Tau Day! There are many other important formulas in mathematics that have pi but no corresponding 2. The one that springs to mind is Euler's famous equation e^(i*pi) +1 = 0. There isn't a right or wrong answer to which constant to use but there is no real reason change hundreds of years of historical precedent, either. So, the notion of replacing all use of pi with a corresponding use of tau is pretty silly. But it is nice to see a mathematical topic (even one this inane) get some light in the media. As Mr Hartl would respond, stop making sense, and shut your tau hole divide by 2. No it does matter, this is classic dummying down of math to the level of fashion and style section of the news. Reminds me of the state of Indiana in the 90s. A state legislator wanted to redefine pi as 3.15 so it would be easier to remember. So we should listen to a Michael Hartl who is pictured in front of a white board. On this white board is a triangle with a correct form for the area of a triangle being, 1/2bh, then equated to 1/2cr resulting in 1/2 tau r squared. While of course, the area of a triangle 1/2bh may be equated to the area of as circle 1/2 tau r^2 and can have it uses, but how the heck does this in any manner suggest that tau is an improvement over pi. This reminds me of Hollywood movie, when a black board is covered with correct but typically disjoint equations that have no real coherent meaning. Looks impressive for the movie but does not mean anything. Sounds like Mr Hartl may be an excellent regurgitator of other peoples ideas, but apparently desperately seeking his own idea with an argument in math that has about as much value as boxer or briefs argument does for underwear. It is which one you prefer or none at all if thats how you roll. He's trying to imply it's easier to remember in that the equations for the area of the circle and triangle have the same form. He might be also trying to say it's more fundamental to map the area of a circle as a triangle as shown. Reminds me of the use in quantum of h vs h bar. h of course being Planck's constant, h bar being h over 2*pi because it occurs so often in the equations. Or should I define h bar as h over tau? When will these zealots open their ears? Pi-ety and Tau-ism are formed of the same digits. The constants don't care if you use 3.14 of one or 6.28 of the other, they can – and should – work in geometrical harmony. In Euclid we trust. They were 'propagating pro-pi propaganda'? Alliterative. A preponderance of promulgators of such would have been over the top. I need to p.
This story was posted 2 days ago and there were only 7 comments by the time I started typing this comment. Where are the science geeks like me? We are over at the belief blog of CNN's website making fun of creationists. Ha, it's so much more fun that discussing the difference between 1 slice of pie and 2 slices of pie. Seriously, I love the number Pi and have been running Pi everyday for 10 years. Go Pi! I'm not as big a dork as those who memorize Pi to thousands of digits though. Those guys are nuts. Off topic and completely irrelevant, and fails to address the article at all. Have you even read the point of the article? At least try to come up with a reasonable explanation of what you like about the number and why. i wish more americans would get involved in the science's and move this country to a more technological base society. instead of the immigrant dependent labor force that runs our farms and factorys. There is a factor infinite and unknown in every mathematical equation and this principle predominates both Pi and Tau. For in the formula of Pi is infinite dissolution and in the formula of Tau is inertia which folds up within itself. Yet, to attain the perception of infinite number the Pi manifests infinite possibility and the Tau must manifest from spiral to point. Then, and only then will 0 = 2 be the factor which multi dimensional space as a pragmatic reality be used. None, breathed the light, faint & faery, of the stars, and two. This is the secret of the universe and on the plane of geometry which we call relationship the man delights in uniting with the woman and the woman parting from the child. When the Pi becomes one with the Tau, it is if the Tau become one with the Pi. Both formula Pi and Tau are correct. Yet, to assimilate them into one equation is to give all the facts to dimensional space. 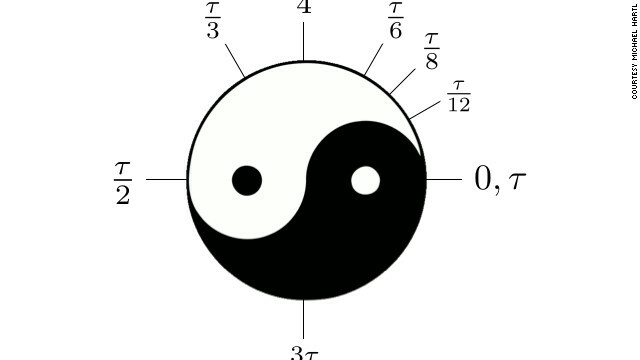 The Taoist diagram in this article implies that mathematical philosophy of the Yin and Yang is going to correspond to the realities of multi universes. The Chinese can go absorb there yin and there yang for all I care. Use of the Tao as a political ideology permits the yang to dominate the yin which manifests as male chauvinism. It implies an unbalanced reality where our species will not evolve and the mental blocks on the youth have been an serious problem to a cognate philosophy. This psychological block which names the old as wise will always permit the Taoist to fall back on all fours. The mathematical philosophy of the pagan Hindoo is infinitely more in touch with the reality of growth manifesting and can even be used to voice a commentary on the Pi and the Tau which open up the first gateways into other universes. “The lengthening of the lingam is one with the yielding of the yoni.” explains the expansion of the universe and the Pi Tau formula of 0 = 2 which are much more efficient and in touch with the reality of Our Species. Proof of its pragmatic reality is the actual use of energy to open up these gateways. Energy devices for opening up gateways to other universes are all based on the Pi and the Tau using the 0 = 2 manifestations of breath into light to attain the doorway. Yet, this research has led to the theory and practice of creating new universes which is beyond the comprehension of everyone reading this unless you have been trained by Me or have a sufficient IQ to parallel my experiments. (The majority of membership of Mensa are unworthy) Naturally, all of you were fools of not listening to My experiments and I spit upon the entire scientific community for their foolish arrogance. Interestingly, while fledgling theories abound - from re-gauging scenarios to zero-point energy theories to ether concepts - all viable systems tend to congregate around a few fundamental principles. These include the need for nonlinear, transient (as opposed to steady state), far-from-equilibrium, and rapidly oscillating systems. These in turn make the possibilities of mechanical over unity systems extremely difficult to achieve, and the mathematics to describe the systems considerably more complicated. The good news, however, is that designs incorporating extensions of Connective Physics, inertial field theories and Mach’s Principle - when combined with state of the art solid-state and other fields of physics - provide the potential for practical, attainable new energy devices. The imperial measurement system hasn't died either, so there is definitely inertia for what we are used to. Though, there is increasingly more hope with digital communication, since search-and-replace of pi is trivial – no need to physically reprint books. Sigh. I'd like tau to replace pi, but I doubt that will ever happen. Ideally, we'd just go back in time and tell Euler about his mistake.